Lots of hazelnuts and berries. Sure enough, all of those stereotypes were real. But there was one thing I was completely unprepared for. The first time I heard the phrase, I assumed that person was referring to a gooey duck dish. Maybe a perfectly rendered roast duck breast with a cherry compote. When I mentioned how much I enjoy duck, the person snickered and corrected me. “It’s a clam,” he said. That’s no clam. It’s the stuff of nightmares, a science experiment gone wrong, a creature from a Godzilla movie. One that could take out the big green lizard easily, and probably King Kong too, if he was in the mood. Not only does it look like one of the scariest creatures to roam the earth, but that spelling makes no sense at all. Geoduck. G-O-Duck. How do you get gooey out of that? Maybe if you flipped a few of the vowels around, it would make sense. It doesn’t look even remotely edible, either. 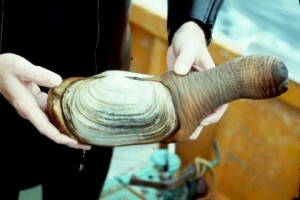 But geoduck is currently fetching around $30 a pound. In China, demand is so high, it can run as high as $150 a pound. That’s a lot of clams! The high price has meant a surge in illegal geoduck harvesting, particularly in Puget Sound, where the long-necked bivalves are abundant. After hearing all these stories, I was intrigued. I have an adventurous palate, and love the cuisine of the Pacific Northwest. Geoduck, despite being odd-looking and inappropriately spelled, was calling my name. I knew I had to try it. Finally, in 2011, the moment of truth arrived. My girlfriend at the time (now my wife) had flown in from Nevada, and I was meeting her mom, who lives in Bothell, for the first time. The GF and I had planned an evening in Seattle that included a sushi restaurant in Belltown that just happened to feature geoduck on the menu. It was baked in a cheesy mayonnaise-based sauce with lots of mushrooms, onions, and fresh herbs. 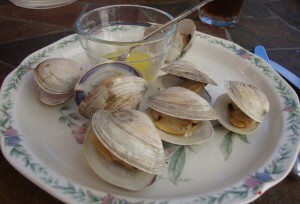 The clam itself was chopped up into bite-sized pieces and looked nothing like the photo above. I’m not sure if I was relieved or disappointed. In any case, we eagerly dug in. And found it to be quite delicious. It tasted…drumroll, please…like – are you ready for this? I don’t know what I was expecting it to taste like. I certainly wasn’t disappointed, but in a blind taste test, I doubt I could tell the difference between a manila clam that costs $5 a pound and a geoduck going for six times that amount. (Or 30 times that amount in China)! At least now I can boast that I have tried geoduck. If you’d like similar bragging rights and are going to be in the Emerald City, check out Shiro’s, the sushi spot we visited (2401 2nd Ave). Geoduck, in one form or another, is a mainstay on their menu. Taylor Shellfish Farms on Capitol Hill is another good spot. In the Portland area, geoduck is a little harder to find. It sometimes appears on the menus of a few local sushi places (Bamboo Sushi, Restaurant Murata, Masu Sushi) but call ahead to make sure they’ve got some if that’s your sole reason for going.